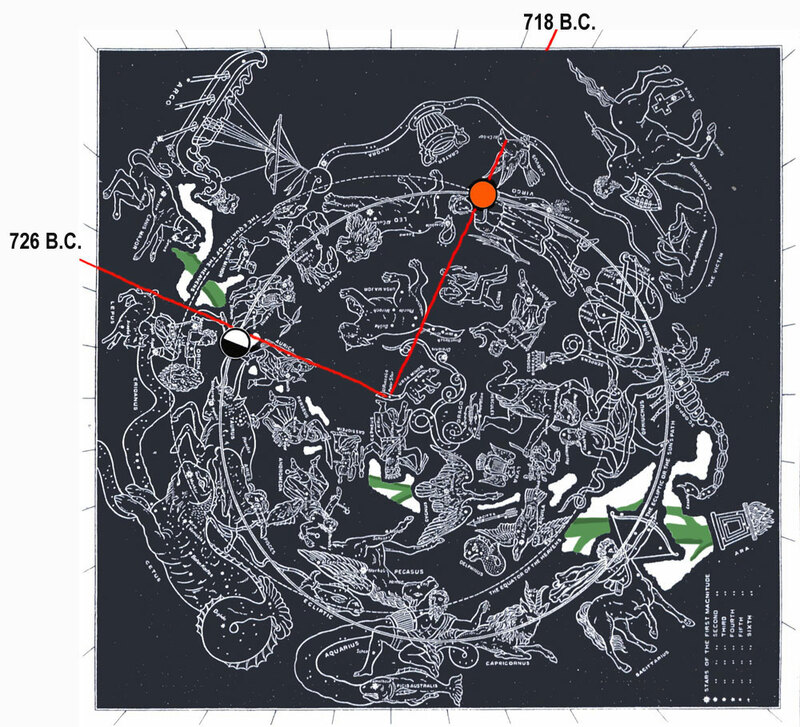 Isaiah Chapter 14:28-32 Star Chart: Clockwise from 726 B.C. when Ahaz died, who was the red radius line "rod of him (Uzziah) who smote you" Philistines (cp. 2 Chronicles 26:6-7), till 718 B.C., when Hezekiah "smote the Philistines, even unto Gaza, and its borders, from the tower of the watchmen to the fortified city" (2 Kings 18:8) is 90° months or 7.5 years from the half moon broken club of Orion to Corvus touching the sun. Notice that the fiery flying serpent is not Hydra, but the red radius line serpent ending at the wings and head of Corvus. Notice that the serpent (Hezekiah) has just finished devouring something large and is trying to digest it. Is this a Philistine city? 29 Rejoice not thou, whole Palestina, because the rod of him that smote thee is broken (Orion's club broken by lunar half moon): for out of the serpent's root shall come forth a cockatrice, and his fruit shall be a fiery flying serpent (red radius line snake with Corvus head and wings and the fiery sun). "Whole Palestine" is mentioned, because it was divided into five districts or lordships, over which there were five lords (Joshua 13:3, 1 Samuel 6:4). Uzziah had smitten and subdued the Philistines (2 Chronicles 26:6-7); but, taking advantage of the weak reign of Ahaz, the Philistines had since then not only recovered their former power, but had gained much more, had even invaded Judea, and taken and held in possession divers cities and villages in the southern part of that kingdom (2 Chronicles 28:18). But the prophet here foretells the calamities which they should suffer as well from Hezekiah, the son of Ahaz, as from the Assyrians; thus humbling their pride and boasting, and encouraging the pious and afflicted Jews with the hope of better times. As much as a fiery flying serpent is more to be dreaded than a common viper; so much more reason have you to fear Hezekiah than his grandfather Uzziah, because the grandson will gain greater victories over you. This Hezekiah did, for he smote the Philistines even unto Gaza, and the borders thereof (2 Kings 18:8). Hezekiah was the twelfth king of Judah, son of the apostate Ahaz and Abi or Abijah, ascended the throne at the age of 25, B.C. 726. Hezekiah was one of the three most perfect kings of Judah (2 Kings 18:5; Ecclus. 49:4). His first act was to purge and repair and reopen with splendid sacrifices and perfect ceremonial the temple. He also destroyed a brazen serpent, said to have been the one used by Moses in the miraculous healing of the Israelites (Numbers 21:9) which had become an object of adoration. When the kingdom of Israel had fallen, Hezekiah invited the scattered inhabitants to a peculiar passover, which was continued for the unprecedented period of fourteen days. (2 Chronicles 29:30,31) At the head of a repentant and united people, Hezekiah ventured to attack the Philistines and in a series of victories not only re-won the cities which his father had lost (2 Chronicles 28:18), but even dispossessed them of their own cities except Gaza (2 Kings 18:8) and Gath. He refused to acknowledge the supremacy of Assyria (2 Kings 18:7). Instant war was imminent and Hezekiah used every available means to strengthen himself (2 Kings 20:20). It was probably at this dangerous crisis in his kingdom that we find him sick and sending for Isaiah, who prophesies death as the result (2 Kings 20:1). Hezekiah's prayer for longer life is heard. The prophet had hardly left the palace when he was ordered to return and promise the king immediate recovery and fifteen years more of life (2 Kings 20:4). An embassy coming from Babylon ostensibly to compliment Hezekiah on his convalescence, but really to form an alliance between the two powers, is favorably received by the king, who shows them the treasures which he had accumulated. For this Isaiah foretells the punishment that shall befall his house (2 Kings 20:17). The two invasions of Sennacherib occupy the greater part of the scripture records concerning the reign of Hezekiah. The first of these took place in the third year of Sennacherib, B.C. 702, and occupies only three verses (2 Kings 18:13-16). Respecting the commencement of the second invasion we have full details (2 Kings 18:17; seq. ; 2Chr 32:9 seq. ; Isai 36:1). Sennacherib sent against Jerusalem an army under two officers and his cupbearer, the orator Rabshakeh, with a blasphemous and insulting summons to surrender; but Isaiah assures the king he need not fear, promising to disperse the enemy (2 Kings 19:6,7). Accordingly that night "the angel of the Lord went out, and smote in the camp of the Assyrians a hundred fourscore and five thousand." Hezekiah only lived to enjoy for about one year more his well-earned peace and glory. He slept with his fathers after a reign of twenty-nine years, in the 56th year of his age, B.C. 697. It is probable, that the inhabitants of the southern parts of Judea, who were particularly exposed to the incursions of the Philistines, the Idumeans, and the Arabs, are chiefly meant here by the firstborn of the poor: and concerning these the prophet foretels, that under Hezekiah’s government they should have food and security for themselves and flocks. And I will kill thy root, &c. — When the root is killed, the plant or tree is wholly destroyed. The meaning therefore is, I will utterly destroy thee, both root and branch, so that there shall be no remnant of thy people reserved, as it follows. This utter extirpation of the Philistines, here threatened, was begun by Hezekiah, and was completed by famine and various calamities, which came upon them afterward.His fruit shall be a fiery flying serpent; from the root and race of David shall come Hezekiah, who, like a serpent, shall sting thee to death, as he did, 2 Kings 18:8. By the Assyrians or Babylonians: probably the same which Jeremiah predicted as coming from the north on the Philistines, Jeremiah 47:2. Some understand this of the Chaldean army under Nebuchadnezzar coming from Babylon, which lay north of Judea; so Aben Ezra; to which agrees Jeremiah 47:1 but most interpret it of Hezekiah's army, which came from Judea: which, Kimchi says, lay north to the land of the Philistines. Cocceius is of opinion that the Roman army is here meant, which came from the north against Judea, called whole Palestine; which country came into the hands of the Jews after the taking of Tyre and Gaza by the Greeks, and therefore the sanhedrim, which sat in the gate, and the city of Jerusalem, are called upon to howl and cry. But the first of these senses seems best, since the utter destruction of Palestine was by the Chaldean army under Nebuchadnezzar; and so the prophecy from the time of Hezekiah, with which it begins, is carried on unto the entire dissolution of this country by the Babylonians. 1. From the Scripture use of this phrase, which generally designs that country, as Jeremiah 1:14,15 6:1,22, &c.
2. From Jeremiah 47, where destruction is threatened to the Philistines from the north, Isaiah 14:2, which all understand of the Chaldeans under Nebuchadnezzar. And whereas it is speciously objected, That this suits not with the next verse, which speaks of Zion’s safety at the time of this destruction of the Philistines, whereas Zion and the land and people of Judah were destroyed together with the Philistines by Nebuchadnezzar; I humbly conceive it may be answered, that that verse is added to express the far differing condition of God’s people and of the Philistines in the events of that Babylonian war; and that whereas the Philistines should be irrecoverably and eternally destroyed thereby, and no remnant of them should be left, as was said, Isaiah 14:30, God’s people, though they should be sorely scourged, and carried into captivity, yet they should be strangely preserved, and after some years delivered, and restored to their own land and temple; whereby it would appear that Zion stood upon a sure foundation, and, albeit it was grievously shaken, yet it could not be utterly and finally overthrown.